Here it is: the seventieth installation of When on Google Earth, the second time it’s been hosted on this blog. I must admit to not knowing much about this particular site, but I did visit it briefly a few years ago, and can assure you that it is very cool. One quick hint to get the ball rolling: as with WOGE 69, this site is in a country that has not yet been featured in this game. 38 Ferhan Sakal Andrea Kay Bat, Al-Khutm and Al-Ayn, Oman 3rd millennium B.C. 39 Andrea Kay Matt B. Serabit el-Khadim, Egypt 2nd millennium B.C. 58 Jaime Geoff Carter Gorgora Nova, Ethiopia, C17th (ce). Ok, the picture shows a group of monuments in an archaeological park at the edge of a mid-sized town in a Spanish speaking country. I cropped the picture to show some of the surrounding streets, in hopes that that would make it easier to identify. I think actually we need another clue, in fact the resolution is not good enough to work out if the archaeological site is the white thingy, and if so whether its an odd-shaped monument (Mayan observatory? ), or a modern building over an excavation – or indeed whether the site is somewhere else on the photo. So in what Spanish-speaking country do they have a roundabout fetish? I’d hate to see this game die on my site, so I’m glad to see that someone’s paying attention. The monuments are all contained in the archaeological park between the roads, in the wooded area and the field—hill, actually—to the east. They’re not particularly visible from the air, but that’s the nature of this kind of structure. The buildings that you see are modern. 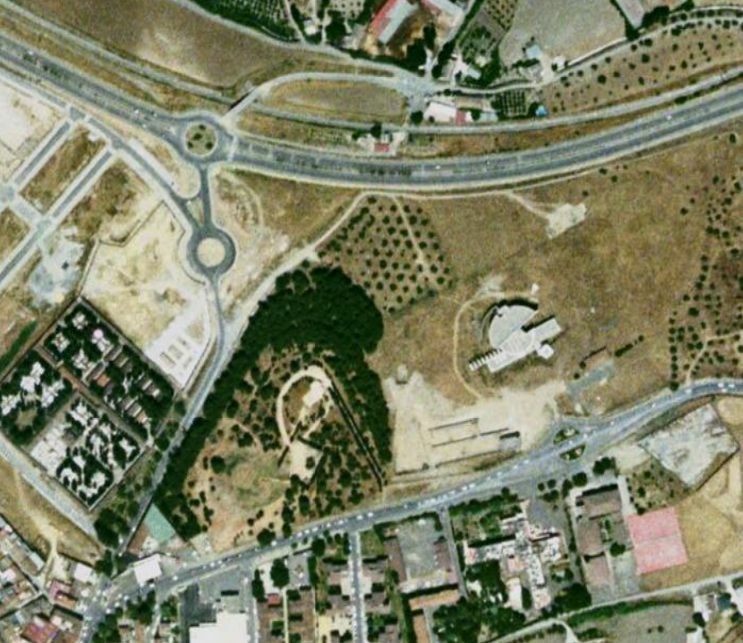 The Spanish-speaking country with the roundabout fetish would be none other than Spain, itself. I give up! (But apparently “I give up!” is to short a comment for wordpress). So, really: Uncle! What site is it? ….I think there’s a comment in here somewhere on the anglosphere knowledge of Spanish archaeology, since we are all so stumped! You’re probably partially right, but I’ll bet the biggest problem is that this one was hosted on my little backwater of a blog. So, would either you or Chuck like to host the next WOGE? Gimme the weekend to play with this first! Sounds good to me. If no-one has figured this out by Monday, I’ll post the answer and let someone else host the next installment. it’s the CUEVA DE MENGA / DE VIERA in Antequera, a burial mound of the 3rd millenium BC. We have a winner! It’s a little site, but very interesting. If you’re traveling around Andalusia, do take the time to stop by and see it. You’ll be glad you did. Oliver, you get to host WoGE #71. Post the link here, and on the WoGE Facebook page, and hopefully we can get the ball rolling again.